The root of the word amateur is the Latin for love. In our hyper-specialized world, “amateur” has become a put-down, which is a shame. The study of birds begun with amateurs. And it’s one of the few contemporary branches of science where amateurs can still regularly rub shoulders, or wings if you prefer, with professionals. I suspect human beings have always had an intimate awareness of birds. As flying creatures, they must have captured our imaginations early. Birds, with their flocking and speed were also early-warning symbols of predators, weather, fire, and the like, which is probably how they came to be thought of as augurs. “Auspices” has its roots in the Latin for bird and the auspex, the observer of birds, both their flight and their entrails. Hunters and shamans both paid great attention to birds for obvious reasons, but where do we date bird-watching as we now understand it? 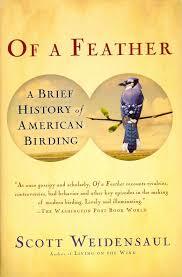 Here are three histories of ornithology and/or bird-watching for your consideration. 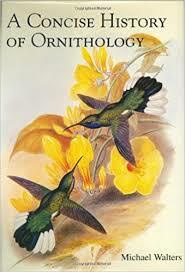 Michael Walters’s A Concise History of Ornithology. The thirty appendices documenting taxonomic plans from Charleton to Gadow gives a good sense of the density of this slim volume. It’s pretty relentless in its capsule biographies and race across the centuries. Best read in small bursts. Walters doesn’t shy away from the dishonesty, feuds, frauds, and downright theft of ideas and specimens that have plagued the endeavor. He is, however, reticent about making the connections between imperialism and natural history. These are inseparable and really need to be discussed. Noted but without comment is this about Johann Friedrich Blumenbach (1753-1840), who is better known as an anthropologist, “of which study he has been described as the founder, and first divided mankind into five races.” That’s significant, considering all the evil that has come from these human-imposed divisions. (It was certainly a step forward to class humans as animals, but then to put them in a hierarchy, as these racial divisions inevitably did….) 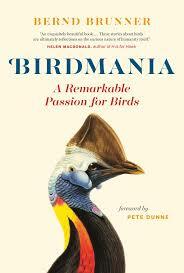 Bernd Brunner’s Birdmania also has a strong internationalist perspective. And includes more women than I’ve ever seen in my readings in this field, so extra points for that. The book is also sumptuously illustrated. It’s translated from the German, but I wish it had been edited with a firmer hand since the paragraphs leap all over the place. I did find one whopping historical error that I’m told will be corrected in the 2nd edition, so you may want to hold off until that comes out. Thank you Matthew, Really very interesting – especially your definition of amateurs. Love is always the best motive. Meaning “one who cultivates and participates (in something) but does not pursue it professionally or with an eye to gain” (as opposed to professional) is from 1786, often with disparaging shades, “dabbler, dilettante,” except in athletics, where the tinge formerly shaded the professional. As an adjective, by 1838. Thanks for the additions, APY! Roosevelt was apparently birding while his father was still in utero! Amazing fellow, TR: once gave a speech after the speech, stuffed into his pocket, stopped a bullet from a non-admirer.